Being born at the end of the baby boomer I recently booked tickets to a Susan Vega gig , I have been to one of her gigs before nearly 20 years back. Generally I try to go to at least one or two gigs a year and it occured what to you younger guys like? Funny thing is I still love the music of my teens I am still into James Taylor, Joni Mitchell, Carly Simon, Don McLean, Elton John, Slade, Kraftwerk and many others but a few years ago right out of left field I became a big fan of the blues after going to a Hugh Laurie gig. 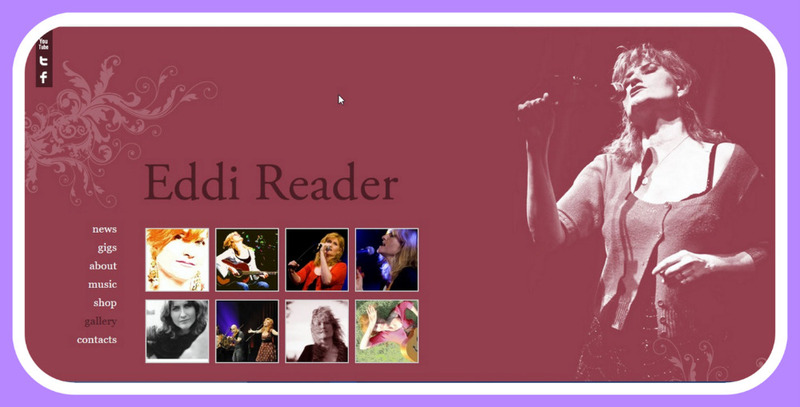 The act I go to to see most often is local singer that was never huge in north america, Eddi Reader formerly of Fairground Attraction. Replied by Tutti57 on topic Way off topic Music -- what do you guys listen to ? I have a wide range of musical interests. I feel like I am primarily a classic rock person. My favorite band is Pink Floyd. I've been on a Rush kick lately. I also like Dream Theater, Radiohead, Muse, The Beatles, and Phish. I enjoy a lot of the 90s alternative rock too. I don't really know a lot of the band/song names but the stuff that was on the radio when I was in middle/early highschool (I'm 36 now). I play the cajon with the Neil Van Dorn Band a couple times a month when they have small gigs where their drummer refuses to play anything but his Niel Pert wanna be set, but it isn't appropriate for the venue. Our guitarist turned me on to a band called Lettuce and they are freaking awesome! If you like funk, you have to check them out. When I'm in the garage I'll throw on Lettuce playlist from Google or YouTube and see where it takes me. I've thought of starting this one myself. I will be 33 this year. I grew up listening to Pink Floyd and Neil Young with my brother. We both have a mutual love for blues guitar and classic rock like Hendrix and Clapton. Metal is my favorite! Hatebreed, Pantera, The Sword and Down. Sometimes I'll go on a rap kick. Not just anything though. Dr. Dre, eminiem and the side project he did with Royce the 5'9 called Bad Meets Evil. Anything challenging, complex and multidimensional. I can't stand repetitive, predictable music. I took the radio antenna off my truck years ago and have never missed it. Last edit: 18 Sep 2017 17:36 by Noah. I play the original version of Clapton's Edge of Darkness quite a lot in the car it sends a shiver down my spine. I saw Clapton join Joe Bonamossa on stage during a PBS special, Which was incredible! Joe is probably one of the greatest modern guitarist, which was solidified in my eyes by this performance of Led Zeppelin's Tea For One. I don't much care for his solo albums (formerly of black country communion), but very talented none the less. Last edit: 19 Sep 2017 07:02 by Noah. Do you guys have nice listening setups at home, car, or garage? Replied by ScannerDanner on topic Way off topic Music -- what do you guys listen to ? Definitely top 5 maybe top 2 metal songs of all time. Replied by Dylan on topic Way off topic Music -- what do you guys listen to ? Lol yep. Mostly positive lyric stuff now but still metal. Replied by Ro-longo on topic Way off topic Music -- what do you guys listen to ? Head banging all the way!!! Paul, you have good taste in music. Nothing better than rocking out to some metal. 48 years old here, Give me some old school Metallica (first saw them in concert opening for Ozzy) Slipknot, Korn, Chevelle, Tool. etc etc. 40 years back I had a girlfriend who was heavily into jazz, I couldn't get it at all now I kind of get it particulary where it meets the blues. Any how I remember this line I got from a TV show " I know about Jazz, there are three kinds of Jazz; Hot Jazz, Cool Jazz and when does the tune start? " Last edit: 22 Sep 2017 08:46 by Andy.MacFadyen. I must have only ever heard the third kind, lmao! Really depends on my mood. I also like Tool but it has to be the right moment to enjoy it. Replied by wgeno07 on topic Way off topic Music -- what do you guys listen to ? I have been playing a lot of 90s hits lately. Replied by onyx on topic Way off topic Music -- what do you guys listen to ?